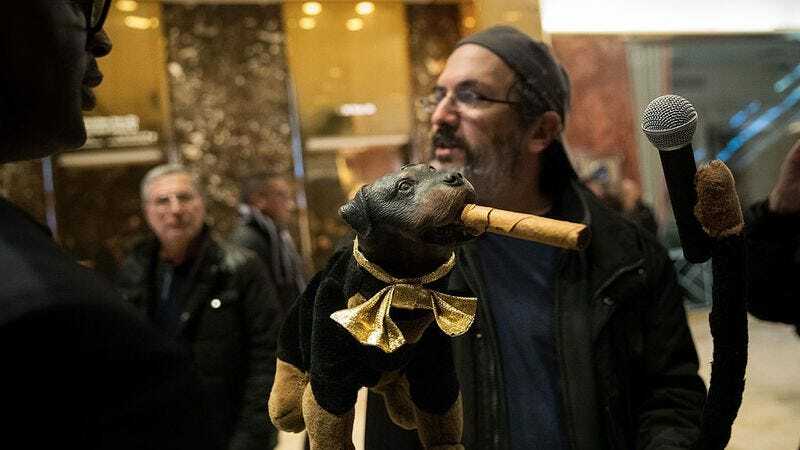 Robert Smigel’s alter ego, Triumph The Insult Comic Dog, has spent the last year riling up Donald Trump supporters, first at the Republican National Convention for Funny Or Die and a few weeks ago at Trump’s presidential inauguration for Conan. Since Triumph is never lacking for insults (and lord knows there was no shortage of material), a collection of Triumph’s outtakes was a delightful inevitability. Well, now it’s arrived, and it’s filled to the gills with sick, sick burns on a multitude of inauguration attendees. Among his topics are health care (“What insurance company do you use, Blue Cross or burning cross?”), Trump’s rug (“The only time I’ve seen hair like that I was 69’ing a shih tzu”), and Mike Pence (“He thinks two guys putting their hands on the same Bible is a homosexual act”), among many others. Triumph even gets to light up his signature stogie on a pile of burning refuse from the inauguration’s protests. Here’s hoping Triumph’s next stop will be the forthcoming juggalo march on Washington, D.C.